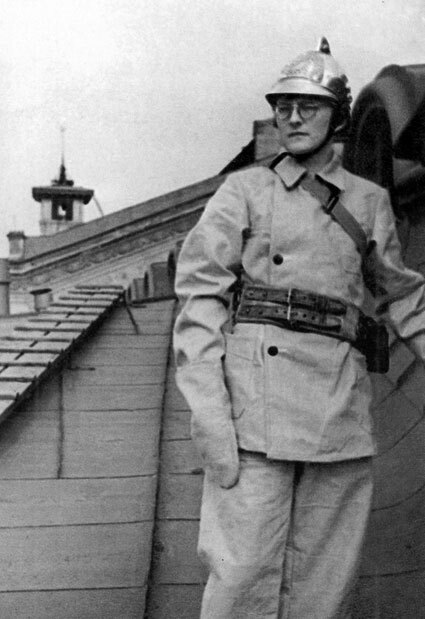 Dmitri Shostakovich in a firefighter’s uniform during the Siege of Leningrad, USSR, WWII, 1941. The Seattle Symphony’s full forces will be onstage for Shostakovich’s epic “Leningrad” Symphony April 16–18, 2015. Here is some history behind Shostakovich and the “Leningrad” Symphony. On July 20, 1942, Dmitri Shostakovich became the first composer to appear on the cover of TIME Magazine. “Amid bombs bursting in Leningrad,” said the caption under a portrait of Shostakovich in an ornate fireman’s helmet, “he hears the chords of victory.” The publication coincided with the eagerly awaited American debut of Shostakovich’s Symphony No. 7 — the “Leningrad” Symphony — and the latest chapter in the high-stakes game of cat-and-mouse that played out between Shostakovich and Joseph Stalin. At a time when Stalin’s enemies were disappearing by the millions, the warning that Shostakovich’s musical path “may end very badly” was no idle threat. From that point forward, Shostakovich buried his private codes and critiques deep within compositions that, on the surface, obeyed the dictates of Socialist Realism, the party’s term for art that appealed to the everyman while supporting the Communist agenda. On its surface, the “Leningrad”Symphony is the paragon of Socialist Realism, celebrating the bravery of a besieged city while skewering the enemy forces. The problem with this story, though, is that we now know that Shostakovich conceived the symphony before the Nazi advance on Russia even started. So if the “Leningrad” Symphony was not a scathing indictment of Hitler’s invasion, then what is its true message? Answers lie just beneath the surface of the so-called “Invasion” theme of the first movement, starting as an inanely simple tune over the rat-tat-tat of a snare drum, and building, through sheer force of repetition, to a raging outburst — a thoughtless cataclysm from within. Reading between the lines, the Seventh Symphony can be interpreted as a defiant stand against Stalin’s cruelty in the years leading up to the war. Such music could never have left Shostakovich’s desk (and there were plenty of finished works that lived there until after Stalin’s death), but the Siege of Leningrad gave Shostakovich a viable cover story, and in turn handed Stalin one of his greatest propaganda weapons. The Soviets snuck a microfilm copy of the score past the Germans, through Iran and Africa to London. The hundreds of performances that followed in England and the United States served to rally public sympathies for the Soviets, the West’s uneasy allies in the fight against Hitler. It was, in the end, a strange dual victory; Shostakovich came away more famous and indispensible (and thus safer) than ever, while Stalin had the great composer right where he wanted him, playing along as a political stooge. All these years later, the only way to decipher their tangled history is to listen anew to Shostakovich’s momentous “Leningrad” Symphony and judge for yourself.